highlight silky, steaky sea bass. Dovetailing Tip: Prepare an additional 2 pounds of Caribbean Sea Bass to use in Fish tacos Ultimo on Day 5. Cut your fish into two equal portions and season very well with salt. Sprinkle with fresh pepper and drizzle the honey on top, splitting the tablespoon between the two filets. Slick the bottom of a 10" or 12" non-stick skillet with olive oil and heat over medium-high heat. When very hot, add the fish, skin-side down. Cook without moving for 3-5 minutes, depending on the thickness. You might want a splatter screen to help keep your stovetop clean. 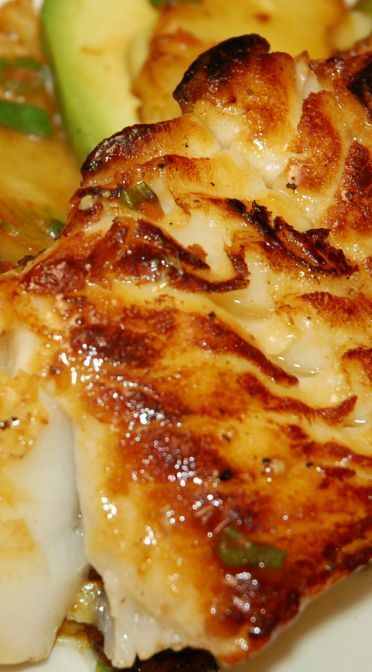 When the fish has started to firm up, flip carefully and let the honey caramelize into a nice "crust", another 3 or 4 minutes. Remove the fish from the skillet and set aside on a warm plate. In the skillet place the pineapple moons in a single layer and toss the diced habanero and sliced scallions on top. Season with salt and pepper. After 2 minutes, gently flip the pineapple and cook 2 more minutes. Remove the pineapple, pepper and scallions from the skillet, and set the fish, skin side down, back in to finish cooking. This will not take long. To plate: alternate wedges of avocado and pineapple on two plates, sprinkling the scallions and pepper on too. Place one piece of fish on each plate atop the salad. Serve immediately.